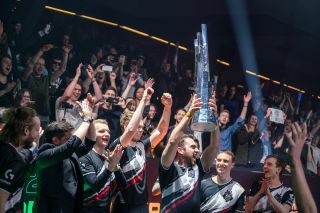 A historic night in Rotterdam as G2 Esports were crowned the champions of the League of Legends LEC Spring Split final. And folks, let me tell you: G2 didn't just win its matchup with Origen, it dominated it. It took G2 just 18 minutes and 31 seconds to complete its Game 3 victory, securing victory in the Finals in the fastest time on record in competitive League of Legends, taking the trophy in an impressive fashion in front of 15,000 screaming fans packed inside Rotterdam's Ahoy Arena. That wasn't the only record set tonight either, with G2 completing its impressive three wins in a combined 74 minutes and 32 seconds – making EU history, beating the previous record by more than 30 minutes. It was always going to be difficult for Origen (OG) to win against a G2 team firing on all cylinders. While OG started off strong in Game 1 – coming into the match with confidence following its 3-1 unstitching of a resilient Fnatic team in yesterday's Semifinals – this G2 team proved to be too hot to handle. This match was, in so many ways, a repeat of last week's Quarterfinals which saw G2 squash OG in foreshadowing 3-0 decimation. G2 has now earned its place as the European representatives in the Mid-Season Invitational (MSI), taking place in Vietnam this May, which will feature the 13 best teams from around the globe. All eyes are now on G2 to see whether it has what it takes to challenge the ever-dominant North American teams – the NA LCS League Finals concluded last night, with Team Liquid sweeping Team SoloMid in a tense confrontation. What's next for G2 and Origen? Origen still has a lot of good to draw from its performance, discipline and attitude displayed over the Playoffs. The team finished in the Spring Season Standings in second place, claiming 12 wins and ratcheting up just six losses. That means the team has a good foundation as it looks towards the all-important Summer Split and keeps its eyes locked on the horizon – on the road to Worlds. For G2, who dominated all Spring Split – settling for 13 winds and five losses, a result that betrays the consistency and potency of its performances – it will now be looking to train in Korea ahead of the MSI, hoping to gain enough momentum to help propel the team through the Summer Split and earn its shot at the Worlds title. The LEC Spring Split Final saw two teams and ten players battle it out in impressive fashion – both cheered on by 15,000 ridiculously loud fans from more than five different EU regions – and it proved to be an electric representation of just how entertaining competitive League of Legends can be. I highly recommend that you give it a watch – even if you have little to no knowledge of the game – as it really was electric. You can find the replay of the G2 versus Origen Finals matchup here, or you can catch up on the action on YouTube or Twitch. Looking for something new to play with your friends? Why not check out our list of the the 25 best online games that you can play right now.